The focus of the 5th chakra healing meditation is on self-expression. Otherwise known as the throat chakra, the central theme is how you express your will and personal strength in the world. I have chosen to use the rose as a symbol of each individual chakra. Nothing is more perfect than nature's pure rose, to illustrate the swirl of energy unfolding. As the vortex of the rose unfolds, so does our own energy system, to unveil its true splendor. You may wish to read about this energy in the subtle body in my article on Chakra Yoga. It is a great introduction to the material in this article. As we move towards the fifth energy and emotional center, we explore the possibility for spiritual integration of all our foundational energies, when we do this chakra healing meditation. With the first three chakras, we have our basic needs met through our communities, our relationships and our personal power. The heart unifies the energy of the first three chakras with the last three, of a deeper consciousness. Remember, the 5th, 6th and 7th Chakras are not "higher" chakras, but energy that is required to be free in order to find your spiritual nature. Energy must always move in both directions. Upward moving energy is important to develop spiritual consciousness, but in order to make "real" this new spiritual reality, the energy must also move downward, to be manifested on "Earth" and in the here and now. The fifth chakra, or throat chakra is energy that manifests in your personal choices. It is the energy and emotional center that recognizes your will and how it expresses itself. Because all of life is a direct result of your choices, any energy center can be affected. Illness itself is a reflection of your choices, so ANY manifestation of illness will also include the fifth chakra. Always keep this in mind as you open to this 5th chakra healing meditation! Over the course of your life, your will matures. First, your family or your tribe or anyone/everyone else has authority over you. Then, secondly, you mature and begin to understand that you alone have authority over you. Finally as you mature spiritually, you will eventually realize that true authority is when you surrender your will to the Divine. This chakra is one that I personally own! I have been healed of thyroid cancer manifested from my personal belief that I had no voice in the world. Even though my cancer never actually became a problem, the diagnosis of it, when I was a mere 37-year-old opened my eyes for the first time to the power of emotional energy to create dis-ease. When I "found" my voice, the whole world seemed to open to me. Even though my personal power in the 3rd Chakra was strong, it wasn't until I was able to express what was "me" that whole new worlds opened. The function of self-expression involves communication. It involves speaking and hearing. With communication comes the necessity of sound, the primary element of the throat chakra. The major life force of this energy center is sound, vibration and resonance. In order to verbalize our ideas, sound and vibration must be connected to the symbols in our minds. With the sound of language, our voices resonate with internal rhythms. If your voice is clear and inviting it resonates in a way that you are heard. As you converse with others, understanding occurs when another entrains with the rhythm of your voice as well as hearing what you actually say. As a result of this voice entrainment, your voice is not merely your words, but how you say them. Everyone has the experience of speaking to a baby or a dog. They don't understand your words, but they entrain to the resonance and the rhythm and understand your message. The challenge of this emotional center is the ability to express yourself through your voice in a manner that is nurturing for all - yourself and others. This can only happen when you are in rhythm with the Divine will, instead of your own. All hasn't been rosy for me, for sure, as you know, we are all works in progress. I continue to bow my personal will to that of the Divine. The lesson of higher consciousness, for me and my personal expression in the world, is to keep opening to expressing myself through the voice of the Divine. That is not always easy. The basic right for the throat chakra is to be heard. To have your voice in the world. To be able to express yourself, with your throat and through the sound of your voice. To speak what is in your heart and soul. Without judgement and without condemnation. To sum, it is about faith in yourself and your authority over yourself because you alone know yourself. This power of choice affects your entire being and each and every emotional and energetic aspect of you is influenced by your choices. But yet the sacred truth of the 5th energy center is "Surrender Personal Will to Divine Will." What a paradox! When you finally find your voice, and a healthy expression of yourself, now these very choices and this will must be surrendered to a Higher Power. When you do this chakra healing meditation, you can enhance your personal self-expression and surrender to Divine Will. 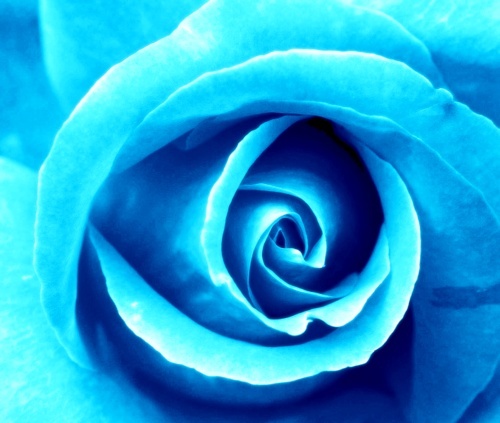 The color and vibration that corresponds with the fifth chakra is blue. The central location, as already implied is at the level of the throat. 5th chakra energy also controls the neck, and the vertebrae in the neck, the mouth, teeth and gums, the trachea and esophagus. The Sanskrit name for the throat chakra is Visuddha, which means, "purification" or "pure wisdom." It certainly takes wisdom to discern the best way to communicate that honors yourself, others and the Divine! The goal of purification of your voice is indeed an ongoing process. Purify your will, as well and your spiritual power is expressed. The mantra for the fifth chakra is "I speak." The basis for this chakra healing meditation is finding and speaking your voice, through the voice of Divine Power. We all know the individuals that always fade into the background. Those who are overly shy, or have a quiet and/or timid voice. Often, but not always, this is indicative of a person who is unable to speak one's truth. Be careful with this energy center, because someone who is "quiet" is not necessarily deficient in fifth chakra energy. You have heard the saying, "If you want to be heard, just whisper." This is a truism and one that I, struggling to be heard, have not always experienced! Those who bow to others will repeatedly, whether voluntarily or involuntarily, and who never voice their own concerns, fall into this category. The oppressed and suppressed individuals and cultures are all too familiar a phenomenon, even in our current world. Loud, obnoxious people, talking over others are familiar to you. Lest you think you are certainly not in this category you may want to re-think your propensity to speak more than you listen. Most of you are so busy expressing that you forget to listen. It is all too easy to be thinking about your next point, while the other is talking, that you don't listen. Your voice then becomes dissonant and you no longer resonate and entrain with others. There is a saying that in order to be a great "conversationalist," try listening. Do this experiment at your next social gathering. Engage others in conversation about themselves. See how long it takes them to realize you haven't said anything about yourself. You will be amazed, that some people never even get around to asking how you are! Become aware of this tendency in you! Willful people have excessive fifth chakra energy. You all know the controlling individual that must always have things go their way. Is this you? Personal choices, personal expression and effective communication are all essential ingredients in this emotional center. The energy consequences of all your choices and expressions, will be supportive, nurturing and kind if done with the integration of your heart. This can only be achieved through the withholding of judgement! This is the greatest act of loving kindness that you can give yourself and others. So isn't empathetic, loving and kind empowerment sufficient for health? The answer seems obviously, "yes." However, when you finally become aware that you cannot control life and what happens to you, or to others, you become aware that your personal power is not enough. You may think your pushing forward through your personal power and will is enough. As long as all is well! As long as long as all goes well, right? You attribute your successes to yourself, don't you? Sometimes, despite you best effort, things go wrong. Then, you attribute that to yourself as well. The REAL essence of the fifth chakra is FAITH. Faith that we do not always know what is best for us. If we trusted in God for a higher truth, a higher wisdom, an all-knowing consciousness, we would have a happy life, or so they say. So why are we so afraid of this? The reason we long for Divine guidance, yet fear it so, is that we are afraid that in giving up our wills, we will give up our physical comforts, our health, our loved ones, our wealth or whatever else is most important to us. Yes, we know the stories of pain and suffering required to follow a Divine Will. Carolyn Myss, in her book, "Entering the Castle" puts it all in perspective, when she says, "Do you really think that if God wanted your money or your home, that it wouldn't be taken?" God doesn't want our money, our family, our physical things. The gentle request from God is that we detach from the authority that these things have over us. When we realize that money, things and environmental control are symbols of power and status, or merely substitutes for authentic power, we can turn over the true authority of our soul to God. Instead of clinging to these items for security, we can now see that they are substitutes for faith in Divine Power. God does not require that we give these things up, just understand why it is we passionately cling to them! Using your "voice" to confess what is hidden in your heart, is healing for the fifth chakra. When you make choices that have less than favorable outcomes, they may be downright harmful to yourself and others. The only way to heal your soul of these negative energy consequences, is through confession. Deep in each of us is the desire to "come clean." This is why even criminals confess to their crimes. When you know that you have done wrong, in order to break the cycle of negative energy and repeated unfavorable consequences, confessing is the answer. Whether done in the Catholic manner, or solely in the presence of God, confession will heal your body, your heart and your soul. If you ask forgiveness of the individual, it is better still. They also, can then heal. Common energy manifestations of blocked energy in the 5th chakra are thyroid and parathyroid problems, vocal cord problems, sore throats, stiff necks, cancers of the ears, neck and throat and hearing problems. Hoarseness and raspy throats are fifth chakra issues. Chronic sore throats, mouth ulcers and gum problems manifest in this emotional center. TMJ, or temporomandibular joint problems, laryngitis and "swollen glands" are of this energy center. Scoliosis has also been named a fifth chakra energy issue. You can heal these 5th chakra deficiencies through the chakra healing meditation, below. Expressing your internal strength is the goal of my fifth chakra healing meditation. Having faith in yourself and in following Divine Will is paramount if you are to have a full, happy and spiritual life. 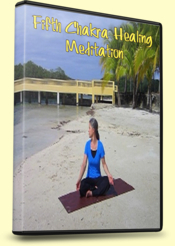 I have designed my chakra healing meditation to assist you in finding your inner Divine voice. The wonderful practice of chakra yoga will help you with meditative poses and affirmations! Stilling your mind is very difficult. My clients teach me that meditating in a traditional fashion, by sitting still on a cushion is next to impossible for them. By going inward through using your body, your mind can follow in the discipline. By doing healing movements and stilling your body, your mind will automatically be stilled! I believe, that it is easier for we Westerners to meditate in this fashion. The moving meditation grounds us and helps us focus, when we are unable. As you practice this chakra healing meditation, focus on your throat as you do the movements. Breathe healing energy into this area as you move. Notice how the movements are designed to help you focus on this area! Open your heart to receive healing! Some of the movements in this particular chakra healing meditation are difficult. Don't judge your lack of ability, but keep on trying them, as I instruct you. Never push through pain, especially where your neck is involved! Listen and hear your Body Window and honor it at all times! There are plenty of easy yoga meditations to do in this video, to aid you in your healing journey, as you work up to the harder ones. Just open to the process, and release into Love and Compassion for yourself and your journey, wherever you are! This throat chakra healing meditation is about 10 minutes long. With all mindful and meditative movements, try to find stillness in your effort. Release and relax into the poses and yield to them. The paradox is that when the effort becomes part of you, it becomes easy. The healing becomes part of you - assimilated in you. This is the true essence of why the "body meditations" work. You will know it when you find this delicious place where your effort is relaxed and supportive! Your whole body is expanded, more conscious and abuzz with life and energy! When this is possible, and it IS with practice, your heart, your mind and your soul are all involved to merge with yourself! Blessings to you on your journey for opening and healing your 5th Chakra. It is my wish that my chakra healing meditation will aide you in discovering this subtle energy system. May your body, your mind and your soul be transformed!